This walk: 2015-2-18. Scuffler, Higher Godsworthy, Black Tor, White Tor, Brent Tor & church, Great Combe Tor, Peter Tavy Church, swimming pool, Colly Brook bridge, Little Combe Tor, ram, Boulters Tor, Setters Tor, Great Mis Tor, Great Staple Tor, Cox Tor, Wedlake, gorse blossom, pitted stone, P stone. Previous walk in this area: 2009-4-29 and 2012-5-23 - these walks started from Smeardon Down quarry car park but were the same circular walk. Most of these photos were taken during a "recce" on 9th February with the remnants of snow on the ground. Looking back at the car. Believed old corn-drill (left) and a definite scuffler (also here) like we had at home (right) for scuffling up weeds in a field, except that ours was tractor-mounted on a crawler tractor like this one - imagine that as a young teenager on a farm - that's family history! Better still, try this link for an old memory of mine - complete with a scuffler. PS - the tractor is a Ransomes MG5 - listen to that engine, they do NOT make them like that any more (600 cc, single cylinder, 4-stroke petrol engine). PPS - this is not me or anyone I know. Public Bridleway Peter Tavy; Public Bridleway The Moor & (centre) Public Bridleway Harragrove. Zoomed view to White Tor (Whittor), SX 542 786, elevation 468 metres (1535 feet). Zoomed view to Boulters Tor, SX 525 780, elevation 336 metres (1102 feet). Smeardon Down Rocks (left) and Boulters Tor (right). Brentor, Church of St Michael de Rupe. The imparting of great wisdom. Little Combe Tor - or is it, on the skyline? No, rocks on Smeardon Down, Little Combe is this side of the valley, out of sight below in this photograph. It must be really little! Zoomed view to rocks on Smeardon Down. Steps (left) and control valve (right) for controlling water level. The stone across the stream also bears cut marks. Colly Brook, Wedlake Brook or Peter Tavy Brook (alternative names). A restraining chains for an earlier bridge. 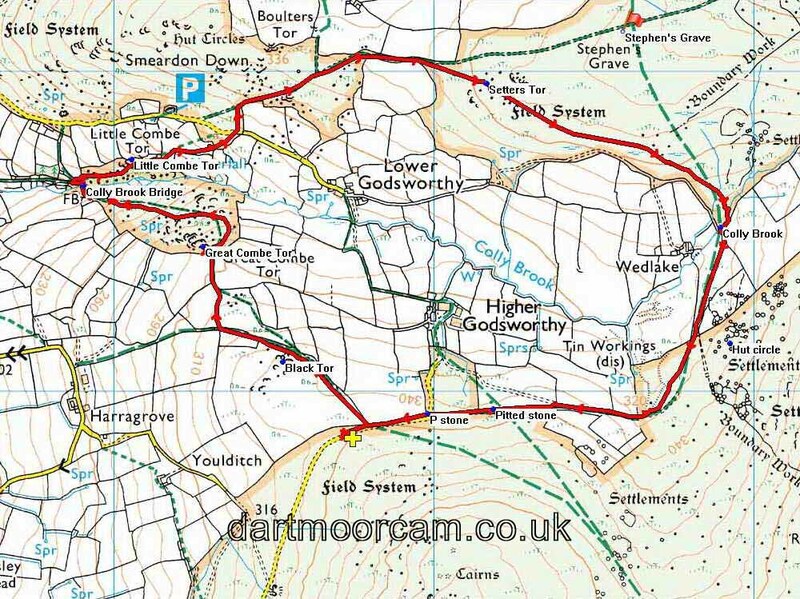 Public Bridleway Smeardon Down � m, Public Bridleway The Moor Via The Combe 1 m, Public Footpath Rd Near Lower Godsworthy and Public Bridleway Peter Tavy. Leat with a take-off just below the bridge that fed the Peter Tavy mill. Little Combe Tor, SX 5204 7771, elevation 243 metres (797 feet). Our Hugh summits Little Combe Tor! Zoomed view to Great Combe Tor across the valley. Setters Tor, SX 532 779, elevation 360 meters (1181 feet), the tors in this area are not composed of granite but the surrounding brown, out-country or border rock. The rock is clearly layered, originally sedimentary (Upper Devonian slates and volcanics, 380-360 million years ago) and then heated to become metamorphic ...... more details here: Dartmoor National Park Authority - Geology and Landforms Factsheet and Introduction to the geology and geomorphology of the Meldon area. The Dartmoor granite was intruded during the Carboniferous Period, 360-300 mya. Roos Tor (left), SX 543 766, elevation 454 metres (1489 feet). Great Great Staple Tor, SX 542 760, elevation 455 metres (1492 feet). Cox Tor, SX 531 762, elevation 442 metres (1450 feet). seen over Higher Godsworthy. Cox Tor, with remains of Bronze Age fields etc. White Tor (hill fort) and Little White Tor to the left. Sheep being moved to higher ground - the farmer on a quad bike is out of sight to the right, rounding up errant members of the flock. Ford at SX 53900 77516 across the Colly Brook. Another view of the possible tin diggings. Looking back for a moment. An attempt to "take the P". This walk was reached by taking the Higher Godsworthy road off the B3357 Tavistock-Two Bridges road, near the top of Pork Hill before reaching the cattle grid going onto open moor. There is parking beside the road where a wall comes in after a long drive up onto the flat top of the hill just before a wall comes in from the left to meet the road. Distance - 6.06 km / 3.77 miles.